Introducing TeamScore®. Making you, your teams, your organisation more agile. Sign up now & track your TeamScore® using feedback and ratings from team members, other teams, and top clients and suppliers. Improve the TeamScore® of each of your teams, and get great work done in less time! Cooperation between empowered Teams is fundamental to both productivity AND work satisfaction! ...but companies are still focused on the top-down performance appraisal of individuals. Introducing TeamScore®, your overall rating of how your team is performing. Team members, other teams internally, and clients/suppliers externally. Rate and give feedback to your own teams & improve team performance using crowd-sourced feedback. 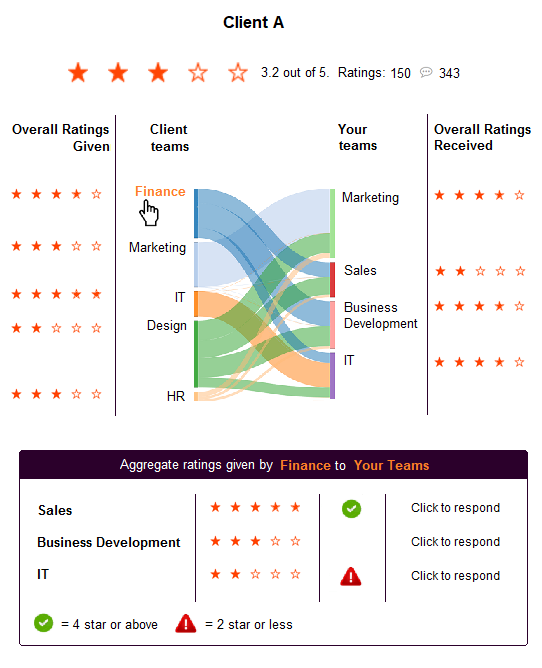 Get ratings and feedback from other teams in your organisation & improve team performance using crowd-sourced feedback. 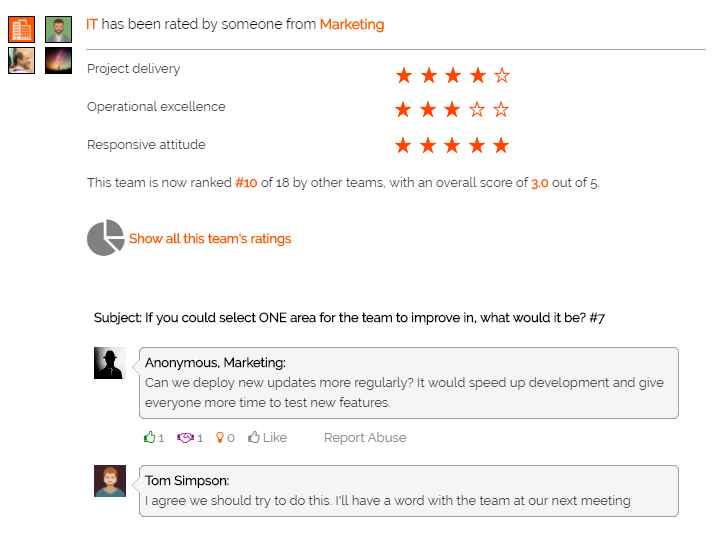 Request feedback from client teams & improve team performance using crowd-sourced feedback. and everyone pays attention to their ratings... and it's free for everyone!" Sales Manager from a tech company. To submit this feedback, please connect to ViewsHub and keep the conversation going! Start by reviewing yourself first! If not, then please Sign Up with a different email address. You can always link multiple email addresses to your account, once you are signed in. ViewsHub helps any team to measure and improve their effectiveness, real time! 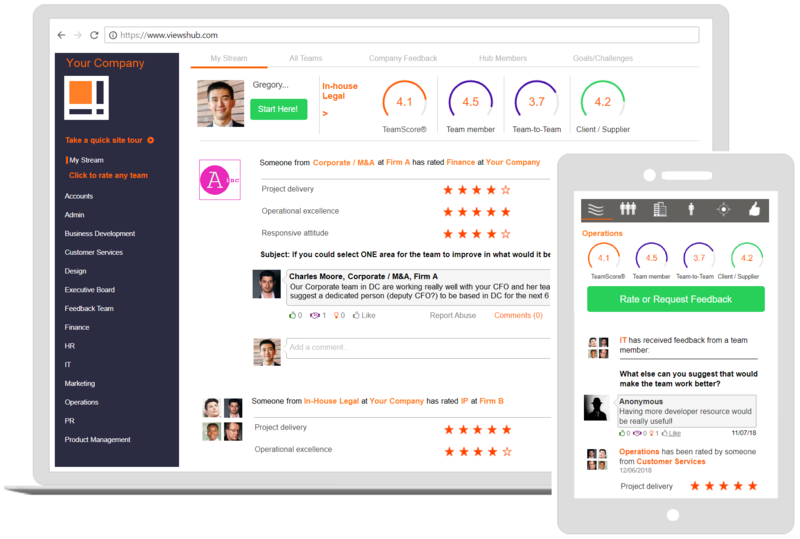 You can rate any team internally or externally, visibly or anonymously. Your team has complete control over who can see its TeamScore®.